Trek – Spy on the Wildebeest | John Downer Productions Ltd. Imagine being part of the Greatest Wildlife Spectacle on Earth. Imagine experiencing it as if you were one of the animals involved. The same brand of revolutionary photography that spied on Lions, Elephants and Bears, now focuses on nature’s most awe-inspiring event – the Great Wildebeest Migration. TREK features a cast of literally thousands, as countless wildebeest, zebra and antelope are joined by the hyena, leopard, jackal, cheetah and crocodile that prey on them. To personalise this story our spycams follow the fortunes of a baby wildebeest. We experience all the significant events of his 3000 kilometre year-long circular journey. This epic story combines natural humour with high-octane drama. But the bouldercams, dungcams and invisiblecams of past productions have grown into an army of over twenty mobile and remote cameras. These give saturation coverage of this awe-inspiring event. Trek: Spy on the Wildebeest is a two part series for BBC 1 starting with ‘The Journey’ and ending with ‘The Crossing’. This hyena learns the hard way what happens if you steal food from lions as this male lion shows who’s boss. 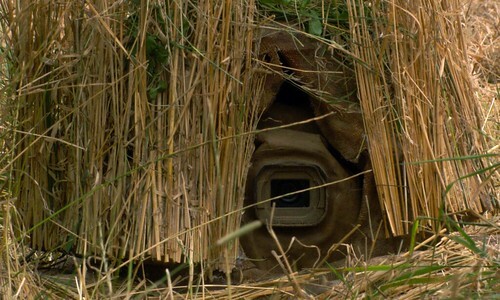 Clip taken from Trek – Spy on the Wildebeest. 1.5 million wildebeest graze 7000 tons of grass a day – that’s 2.5 million tons a year – the equivalent of mowing 6000 Wembley stadiums a year. 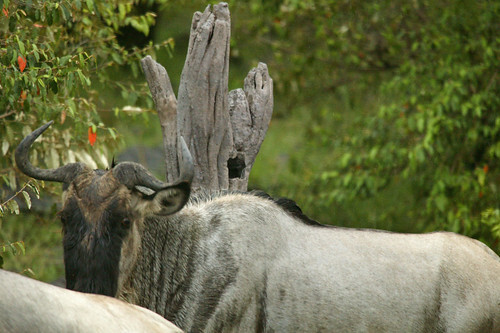 Wildebeest urinate enough to fill 125 road tankers, plus 500 tip trucks of dung, a day. They graze for 18 hours a day. The entire herd drinks enough water to fill five Olympic-sized swimming pools a day. In one year they travel 3000 kilometres. Over one and a quarter million wildebeest take part in the migration. Each February the Serengeti plains experience the world’s largest baby boom. In just three short weeks over half a million calves are born. Just 50% of the calves survive their first 6 months – quarter of a million succumb to disease and predators. The calf learns to use its legs faster than any other mammal – up and walking in under four minutes. The thrashing of young saplings by a quarter of a million bulls helps stop the spread of the woodlands. Their destructive behaviour inadvertently preserves their precious grasslands. Designed specifically to operate in the Serengeti’s short grass plains, tortoisecam carries the latest HD camera and used caterpillar tracks to power through the grassy plains. Designed to film the infamous river crossing. 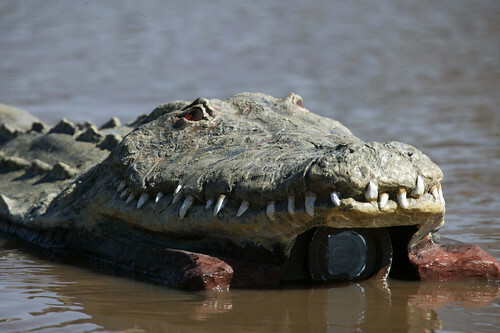 Croccam houses two battery powered hydro jets and can swiftly negotiate the rapids with ease. The onboard HD camera captures a crocodile’s view of the wildebeest river crossing and is tough enough to withstand the stampeding masses. Used to film the migration as they navigated through the dense forests. The approaching herds activated tree cam by triggering the infrared sensor. The disguise was so good that even birds surveyed it as a potential nesting site. 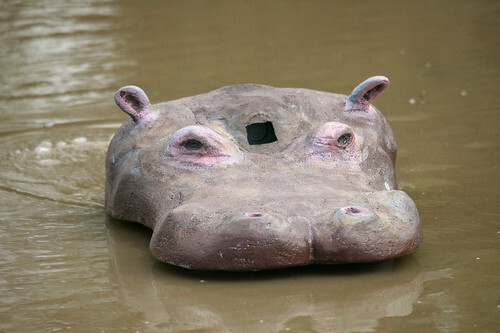 Based on the same boat technology as croccam, hippo cam was able to infiltrate hippo herds without arousing suspicion. Small and ultra quiet, dragonflycam housed the world’s smallest HD camera. Capable of flying 40 mph, this micro helicopter could fly alongside stampeding herds undetected. This state of the art remote helicopter is quieter and more powerful than the dragonfly. 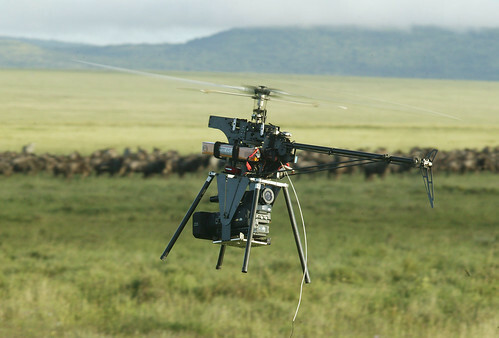 Its massive range and high altitude capabilities provided wide and detailed coverage of the migration. 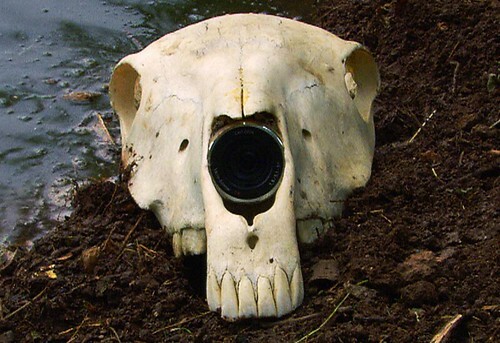 Skullcam was deployed on the front line of the migration, and was especially useful along the exit shoots of the river. This was by far the toughest camera and survived being trampled by thousands of wildebeest and zebra. Bouldercam has been modified into Grass cam. This go anywhere camera blends perfectly into the grassy plains for close proximity filming of the herds. 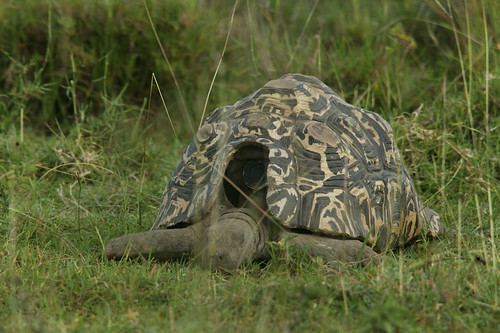 First seen in Elephants: Spy in the Herd, plops were modelled on elephant dung and were ‘plopped’ down in all terrains. These highly versatile cameras proved the most successful of all devices and captured key moments of the migration. First seen in Elephants: Spy in the Herd, dung cam proved to be a valuable backup and often worked alongside tortoise cam.